In Jan. 12th, “2017 China motorcycle white paper presentation and annual awarding ceremony”, was opened at the capital of motorcycle “Chongqing”. Haojin was awarded of “ten best exporters of China motorcycle industry ” from this ceremony. This activity was organized by media motorcycle information magazine, which is most professional and with powerful force in China motorcycle industry.And supported by China car industrial association motorcycle chapter, China motorcycle chamber of commerce, China car and motorcycle sports federation and other professional institutes. Participation in enterprises including most of mainly motorcycle, tricycle manufacture enterprises, and most of topping international motorcycle brand, new energy enterprises, outstanding supporting enterprises, finance industry and other industry elites. As the forefront brand of Chinese motorcycle and got the highly support from China Ministry of Commerce, Haojin product are sell to the five continents and fifty countries and areas. Haojin promotes technology innovation, controls quality strictly and enhances brand image year by year, which makes it become customers’ favorite products. 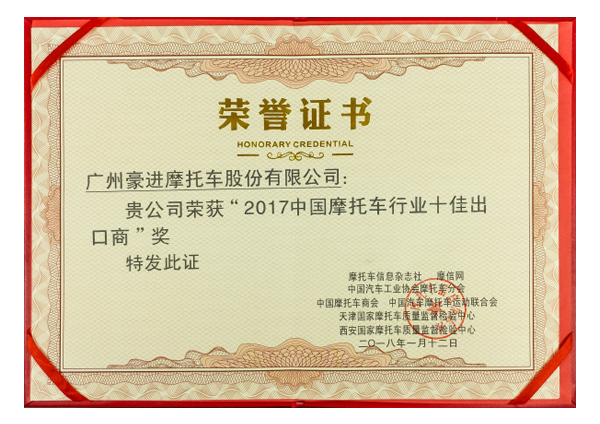 Haojin was awarded the honorary title “ten best exporters of China motorcycle industry” at this time. It is also the best demonstration of affirmation from global users for Haojin product quality.